The Burmese python (Python molurus bivittatus) is a nocturnal predator that kills its prey by constriction. It is the largest and most water-dependent of the Python molurus complex, though it lives on land or on trees when juvenile. It threatens native species of amphibians, birds, lizards, snakes and bats. P. molurus bivittatus represents a threat to humans, particularly small children as well as pet animals, and it may damage agricultural activities, such as chicken farms. Worldwide, there are documented attacks of adult pythons on full-grown pigs, goats, caimans and even pet-owners. In Puerto Rico there are concerns that the Burmese python may out-compete the two native boa species: the Puerto Rican boa (Epicrates inornatus) and the Mona Island boa (Epicrates monensis), which are smaller in size than the Burmese python. Adult Burmese pythons have light-coloured skin with a characteristic pattern of many dark brown patches bordered in black, and may measure more than 20 feet. Adult females are larger than adult males. The pet industry has developed a variety of \"morphs\" with a number of different colorations and patterns, including albinos and \"dwarfs\". The Burmese python is a CITES Appendix II species (Tsu-Way et al. 2006). Burmese pythons reach sexual maturity four years before they can breed succesfully. Females normally lay 12-36 eggs, but are capable of laying over 100, after a 60-90 days gestation period. The mother incubates the eggs by coiling on top of them. Incubation takes about 2 months afterwhich hatchlings emerge. Typical life span is 15-25 years (Ferriter et al. 2006; Krysko et al. 2008). 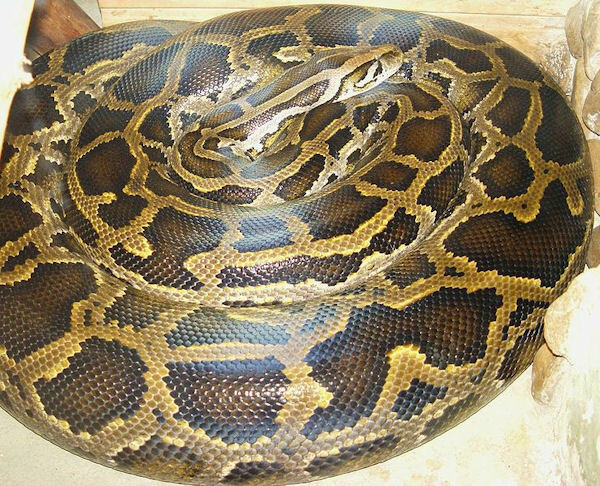 The international pet trade has turned the Burmese python into a valuable merchandise, various morphs in different colors and patterns have been developed which are assigned high prices. More than 144,000 Burmese pythons have been imported into the United States for exotic pet trade from 2000-2005 (Lovgren, 2005). In its native range, large numbers are collected for their skin, sometimes to make folk medicines, and, in China, for its meat. In some countries, many consider them beneficial for their control of vermin such as rats. The subspecies Python molurus bivittatus occupy a wide variety of habitats: tropical forest, savannahs, riparian areas, marshes and swamps, and continental tropical islands, from sea level to moderate elevations. Human presence have forced them to adapt to live in cultivated sites, and even in suburbs. They exhibit both terrestrial and arboreal habits, and they need to enter water on occasion, specially prior to shedding. They can stay underwater without breathing for as much as half an hour. They are excellent climbers and swimmers. The subspecies Python molurus bivittatus is sexual and oviparous. Females can breed at their fourth year of age and usually lay 12-36 but may lay as many as 100 eggs after a 60-90 day gestation period. Neonates lead independent lifes from birth (Ferriter et al. 2006; Krysko et al. 2008). The subspecies Python molurus bivittatus is strictly a carnivore. They prefer small mammals and birds, but it eats any animal that it can catch and kill by constriction. Diet in the Florida Everglades consists of racoon, rabbit, muskrat, squirrel, opossum, cotton rat, black rat, bobcat, house wren, pied-billed grebe, white ibis, and limpkin (Weissmueller, 2007). Principal source: Barker, David G. and Tracy M. Barker., 2008. The Distribution of the Burmese Python, Python molurus bivittatus. Bull. Chicago Herp. Soc. 43(3):33-38. Ferriter, Amy, Bob Doren, Carole Goodyear, Dan Thayer, Jim Burch, Lou Toth, Mike Bodle, Jon Lane, Don Schmitz, Paul Pratt, Skip Snow and Ken Langeland., 2006. Chapter 9: The Status of Nonindigenous Species in the South Florida Environment. 2006 South Florida Environmental Report. Pitt, William C. and Gary W. Witmer., 2007. Chapter 12 Invasive Predators: a synthesis of the past, present, and future. In Predation in Organisms Springer Berlin Heidelberg. 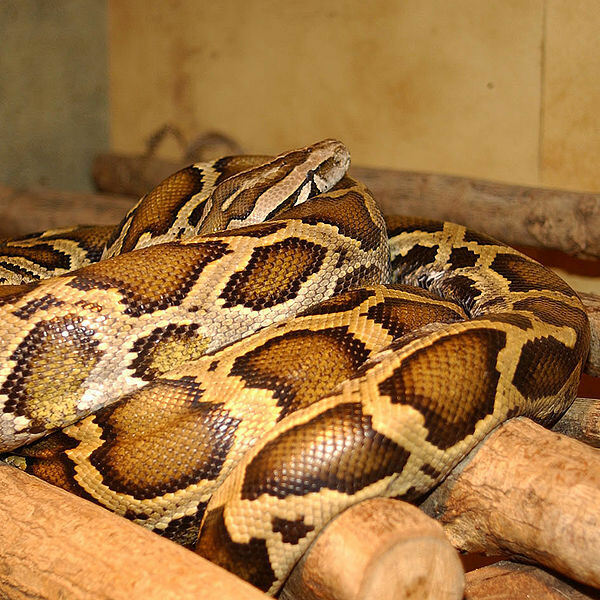 Recommended citation: Global Invasive Species Database (2019) Species profile: Python bivittatus. Downloaded from http://www.iucngisd.org/gisd/species.php?sc=1207 on 21-04-2019. The Burmese python threatens native species of amphibians, birds, lizards, snakes, and bats introduced ranges by predation, competition, and disease transmission. This species also represents a threat to humans, particularly small children, to pet animals, and is known to damage agricultural activities, such as chicken farms. Worldwide, there are documented attacks of adult pythons on full-grown pigs, goats, caimans and even pet-owners. In Puerto Rico there are concerns that Burmese python may outcompete the two native boa species: the Puerto Rican boa (see Epicrates inornatus in IUCN Red List of Threatened Species), the Mona Island boa (Epicrates monensis monensis), and the Virgin Islands boa (Epicrates monensis granti) which are smaller in size than the Burmese python (Pitt and Witmer, 2007; Reed , 2005). Preventative measures: Since the established population in Florida is the result of pet releases or escapes, biologists in charge of Brumese python management and removal in the Florida Everglades advocate increased pet owner education, recquiring a license to own imported snakes as in Australia, stircter standards for snake import, and harsher penalties for their release throughout the United States to prevent further establishement. State agencies in Florida (USA) are establishing regulations on the purchase and trade of invasive reptiles. The USFWS Fish and Wildlife Coordination Act Report for the Comprehensive Everglades Restoration Plan recommends the removal or partial removal of canals and levees which serve as means of transportation for Burmese pythons and other invasives among wetlands (Ferriter et al. 2006). Additionally, biologists recommend recquiring a liscense to own potentially invasive reptiles, as in Australia, stricter standards on snake import, and harsher penalties for snake release in the United States to prevent new invasive populations of Burmese pythons (Weissmueller, 2007; Pitt and Witmer, 2007). Physcial: Removal of Burmese pythons have been performed in Florida (USA) by Florida Park Service, Fish and Wildlife, and Fire Rescue employees. The use of radio tracking, pheromone lures, traps, hand capture and locator dogs have been employed to manage and remove Burmese pythons. Detailed mapping and tracking tracking of Burmese pythons and even a \"Python Hotline\" to report sightings and request removal have also contributed to removal efforts in Florida (Beck et al. undated; Ferriter et al. 2006). Informations on Python bivittatus has been recorded for the following locations. Click on the name for additional informations. Beck, Sandy; Alice Clarke; Larry Perez, Denise Feiber., undated. Florida Invaders (Ed) Alice Clarke. A Joint publication of the National Park Service (NPS) & Florida Fish and Wildlife Conservation Commission. Environmental Law Institute (ELI), 2008. Cooperative Prevention of Invasive Wildlife Introduction in Florida. Technical Report. Copyright � 2008 Environmental Law Institute�, Washington, D.C. Cover art courtesy of Jessica Western. All rights reserved. ELI Project No. 070501. Summary: ELI report, Cooperative Prevention of Invasive Wildlife Introduction in Florida, examines the complex issues faced in addressing the issue of wildlife invasions in Florida. The report analyzes state and federal laws and regulations that affect invasive wildlife species prevention efforts and makes recommendations intended to harmonize state and federal agency efforts in Florida under existing legal authorities. It also recommends changes to the existing laws and regulations that would enable agencies to proactively address the harms posed by nonnative wildlife. United States Geological Survey (USGS). 2008. Python molurus bivittatus. USGS Nonindigenous Aquatic Species Database, Gainesville, FL. Barker, David G. and Tracy M. Barker., 2008. The Distribution of the Burmese Python, Python molurus bivittatus. Bull. Chicago Herp. Soc. 43(3):33-38, 2008. Burridge, M.J. and L.A. Simmons., 2003. Exotic ticks introduced into the United States on imported reptiles from 1962 to 2001 and their potential roles in international dissemination of diseases. Veterinary Parasitology 113 (2003) 289�320. Lovgren, S. 2005. Python-tracking puppy trains to patrol Everglades. National Geographic News. Summary: A news article concerning Burmese pythons in Florida. Rice, G. Kenneth; J. Hardin Waddle; Brian M. Jeffery; H. Frankin Percival., 2004. Herpetofaunal Inventories of the National Parks of South Florida and the Caribbean: Volume I. Everglades National Park. Open File Report 2004-1065, US Department of the Interior, US Geological Survey. Van Mierop, L. H. S.; Susan M. Barnard ., 1976. Observations on the Reproduction of Python molurus bivittatus (Reptilia, Serpentes, Boidae). Journal of Herpetology, Vol. 10, No. 4. (Oct. 25, 1976), pp. 333-340. Weissmueller, Z. 2007. Swamp Wars. Orange and Blue, Spring 2007. University of Florida. Summary: A University of Florida magazine publication with good information from Florida wildlife specialists.